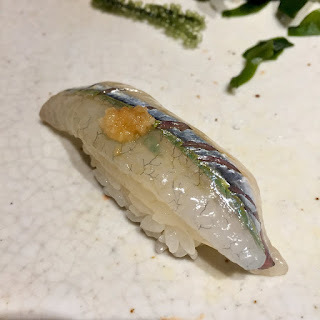 The Japanese take their sushi training and preparation seriously as I briefly wrote about in my first sushi post at Azabu in New York City. Seeing as I've previously touched upon the discipline of becoming a sushi master I thought that mentioning some historical facts would help us appreciate sushi as it has developed to what we know it as today. 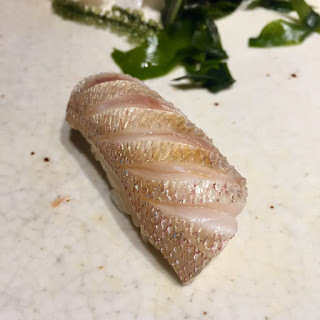 Almost like a perfect mistake, it is believed that a couple of thousand years ago the people of Southeast Asia were preserving fish on fermented rice, which seems like a natural progression for the way we enjoy nigiri today. However, the major change only took place in the early 19th century in the city of Edo, modern day Tokyo. 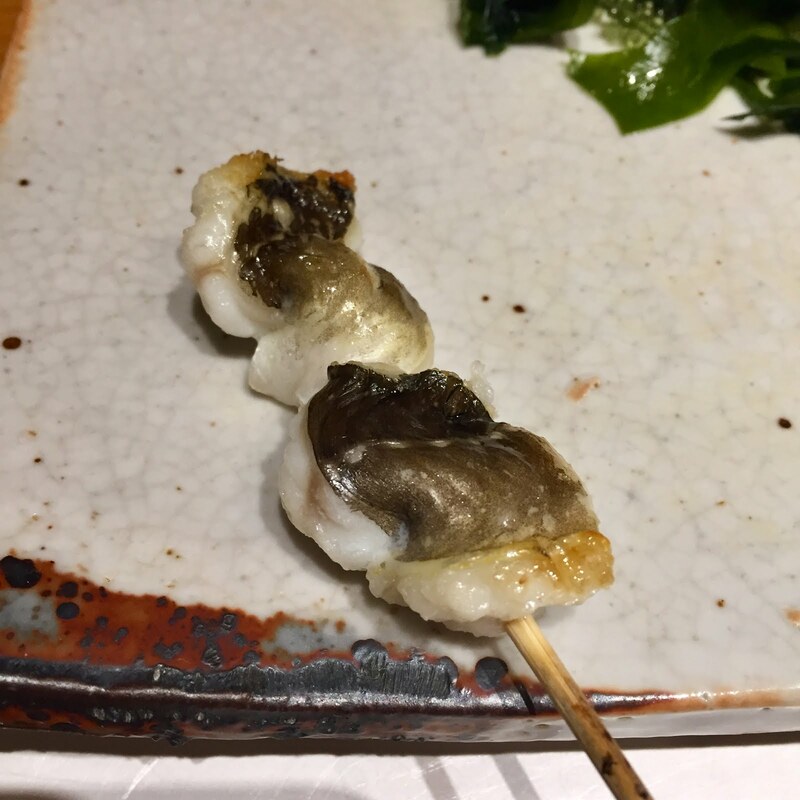 Innovators placed fresh fish on balls of vinegared rice giving birth to the modern version of nigiri. Edo-Era sushi Chefs did not have the luxury of refrigeration which led to developments of new preparation methods to extend shelf life such as cooking or saucing fish one way or another. Fast forward today to Taku sushi bar, tucked into the residential streets of Nishi-Azabu, a trendy Tokyo district. Chef Kenji Ishizaka knew that he wanted to make people happy through cooking since he was a child. 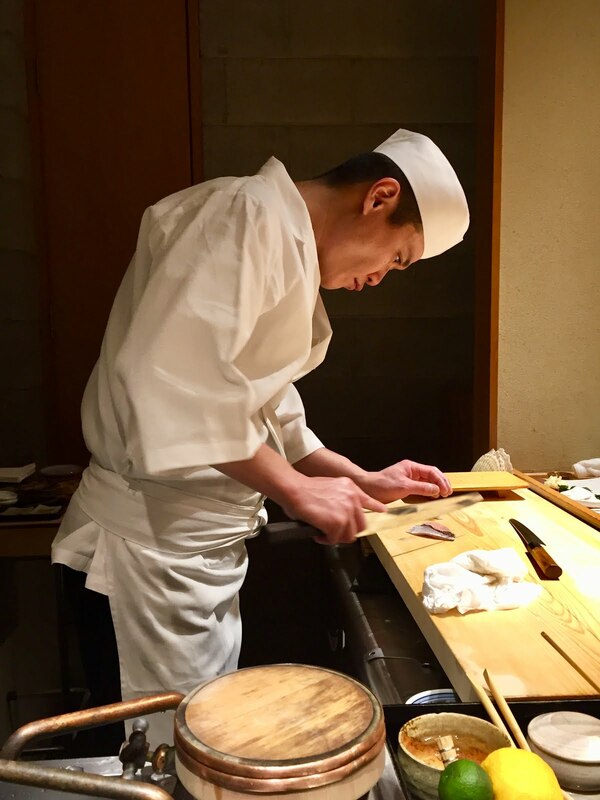 He joined the Taku team in 2010 and has been the interim head sushi master since 2016. 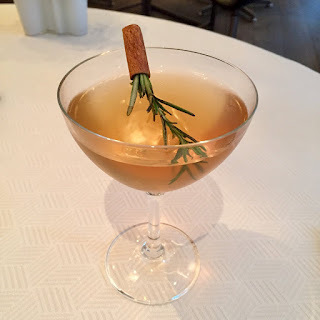 The two Michelin star restaurant has been welcoming guests into their private dinning rooms for over a decade. With a rather minimalistic interior of exposed cinder blocks & concrete walls and boxy exterior, Taku is not like other traditional sushi restaurants, yet wood counters & wooden decorative accessories soften up the space. The main counter area has seating for 8 and a private room for 2 to 6 guests - get your reservations early. Speaking of reservations, I mentioned in my previous post on Den how difficult it can be to secure them in Japan. 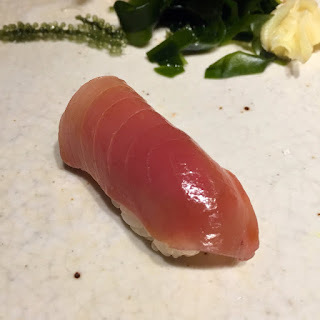 It's no different for sushi restaurants, in fact even more difficult as the most exclusive sushi bars only seat 6-8, only serve locals, regulars & their guests and can be as pricey as ¥38,000, roughly $340US. What sets one sushi restaurant, or master, apart from another are the details. Examples at Taku are; alternating between red & white vinegar and two types of rice to best pair with the fish variety, wiping the dish after every course to avoid fish oils or vinegars mixing, monitoring serving temperatures for fish & rice, and of course Chef visits Tsukiji, the largest fish market in the world, every morning to select the finest fish to serve his guests. 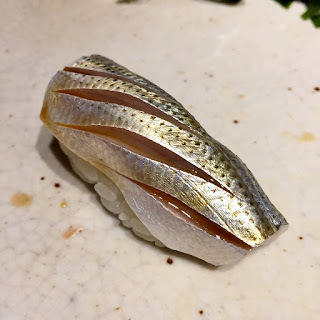 At Taku they also do something that I've never seen before, illustrated in a photo below. 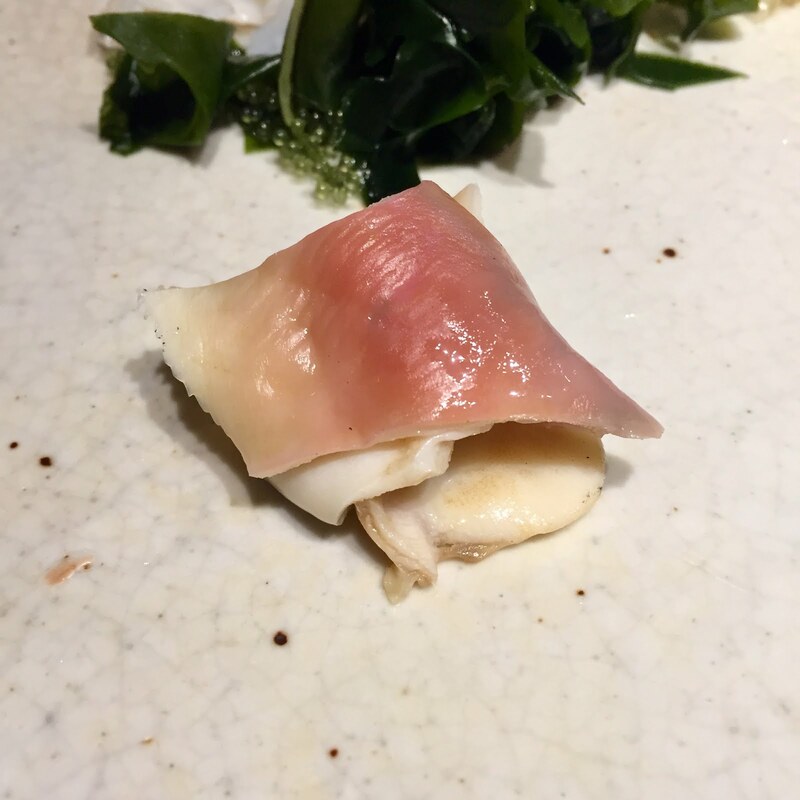 For the length of the meal chef points out which fish or seafood is being enjoyed in a handbook which stays on the table. Albeit printed in Japanese, there's no additional knowledge to learn-unless you read Japanese, but it's interesting to see none the less. 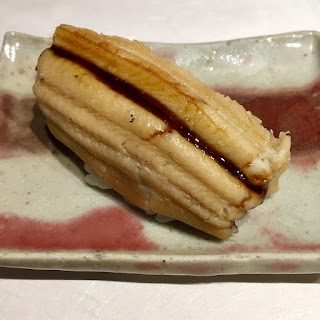 Despite not having a handbook to offer you I hope I shed some light on a thing or two sushi related and that my meal at Taku below inspires you to seek out more traditional sushi next time around. I'm posting this photo as there's a chuckle worthy story that goes with it. I was under the impression that this was another vegetable dish like the previous course. 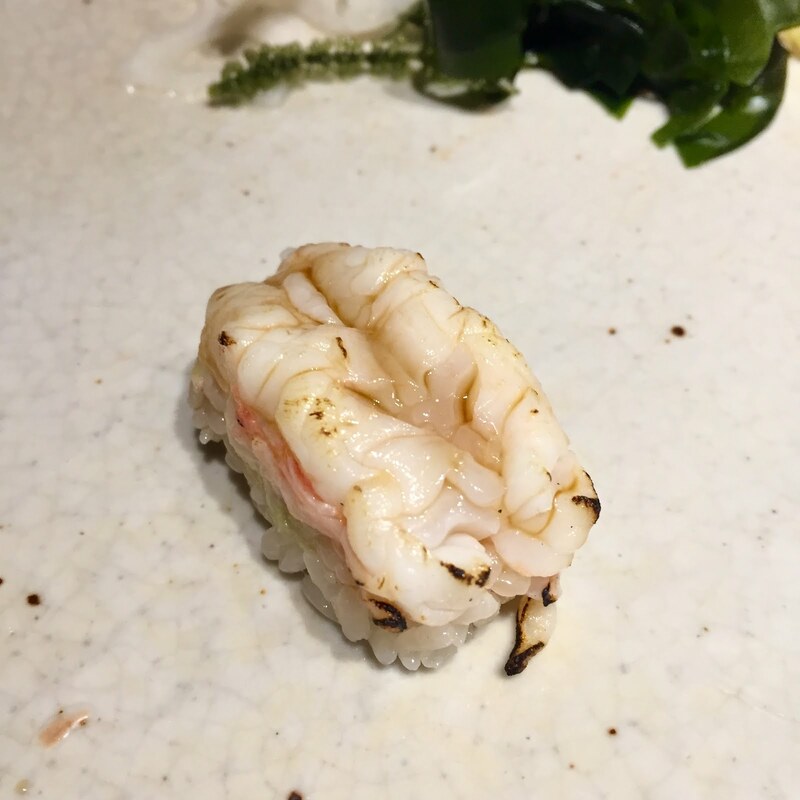 Instead when the Chef noticed that I had eaten all of it he looked at me as if he was embarrassed for me and said "palette cleanser" as he refilled my dish. 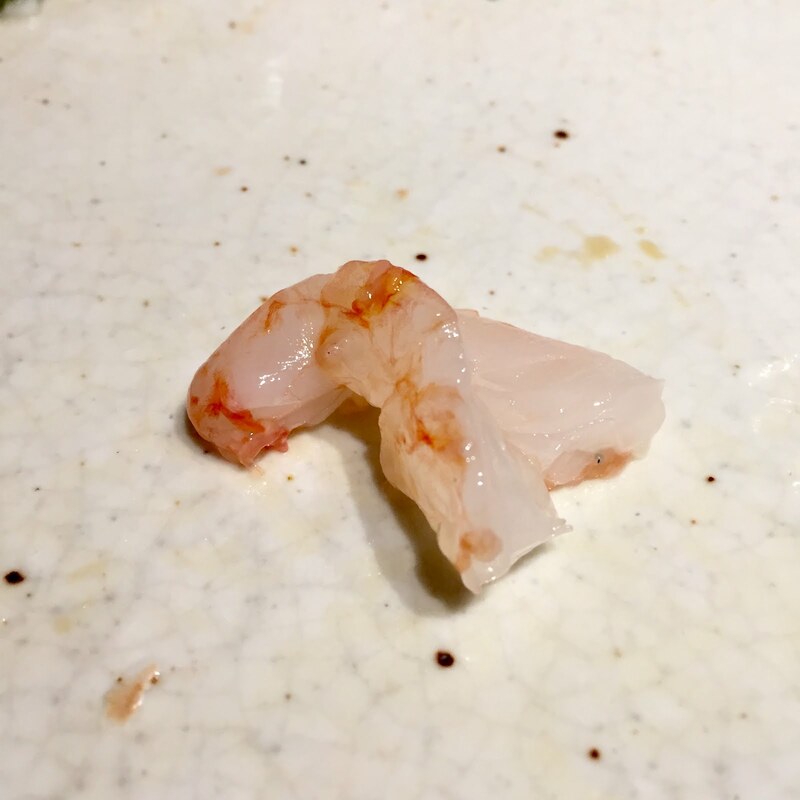 These were to be eaten between each piece of sushi, much like ginger. Chalk it up to cultural ignorance, but now I know. 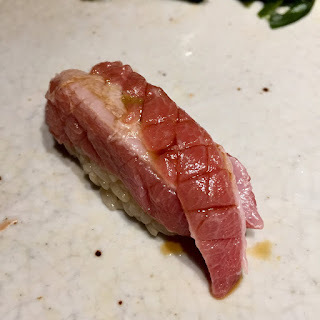 The word toro means fatty belly meat and also "to melt". This is referring to the fat melting in one's mouth. There are two varieties of the delicacy from different parts of the tuna. Chu-toro is found alongside the fish and is recognized as "medium fatty". 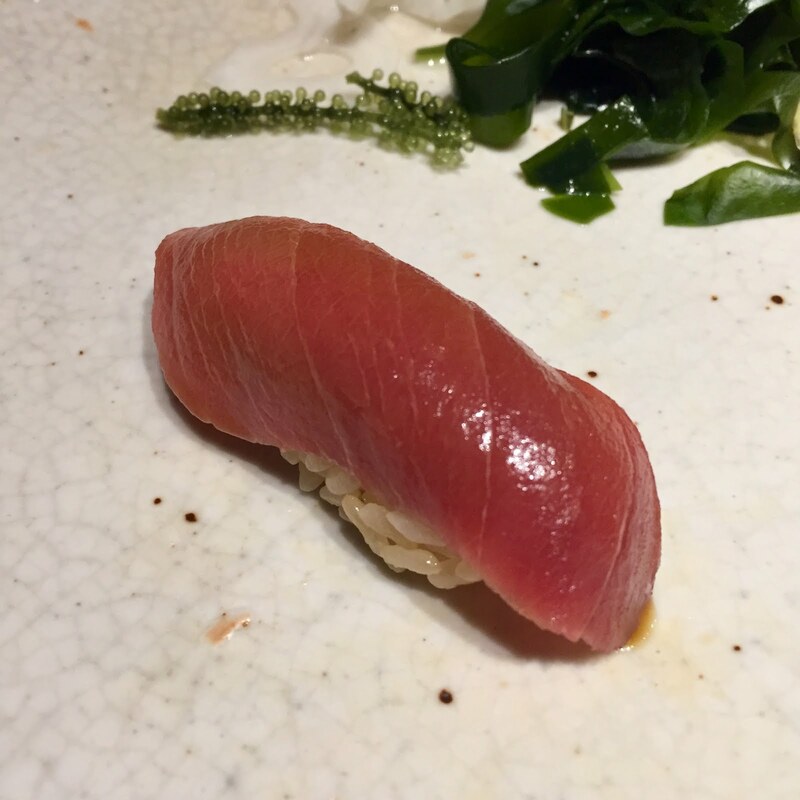 O-toro is the underside of the tuna, the fattiest part of the fish. 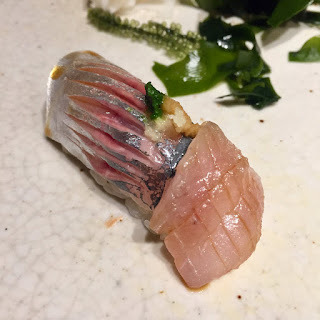 I omitted some more common varieties such as King Salmon and Grilled Shiitake Mushroom in this post, but at the end of the meal sushi master had prepped & served 17 pieces of fish & shellfish in addition to small plates and a scoop of green tea ice cream for a total of 25 items. It was fascinating to see Chef slice each piece of fish and handle the rice to perfection. 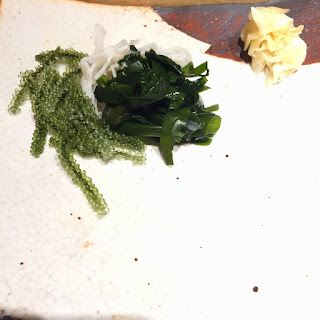 At the end of the meal he mentioned that he'd been studying sushi for 24 years and still had a lot to learn. 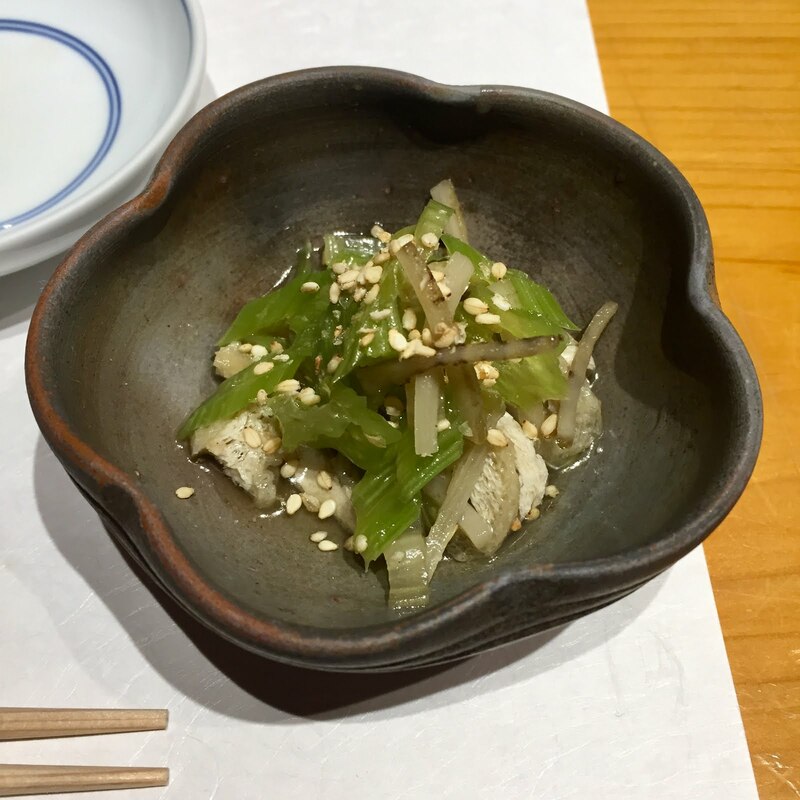 Enjoying the Moby soundtrack and exchanging just enough words in English to understand the variety of fish, where it was from and whether or not to enjoy it with soy sauce, I thought to myself that this was a remarkable experience and definitely one to do if you get the chance. 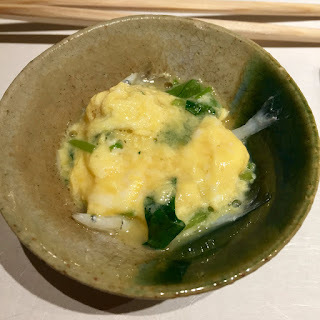 I hope you enjoyed my recent posts throughout my trip to Japan, as that's a wrap! As they say in Japan, Sayonara! Taku does not have their own website, but for more information you can visit Table All's page for the restaurant here. 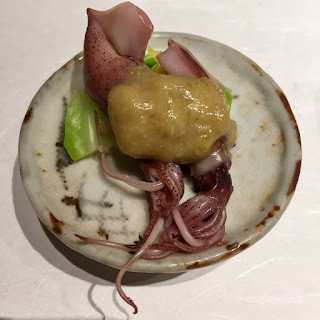 Interested in Asia's second best restaurant? Have a look at Den here.